A California law forcing pro-life pregnancy centers to advertise for abortion was brought to a permanent end Friday evening, thanks to an order by a federal district court. With that, the 2015 law, AB 775, which essentially was struck down by the U.S. Supreme Court in NIFLA v. Becerra in June, is now officially dead, unable to compel pro-abortion speech from life-affirming pregnancy centers. 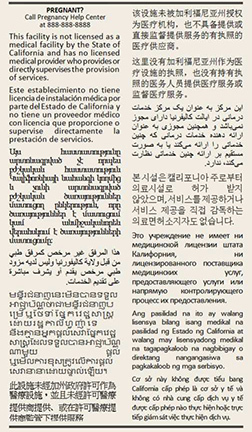 The law also required non-medical resource centers to post signage saying that the center is not licensed as a medical facility and does not have a licensed medical provider — even though non-medical centers do not require either. It also mandated that the disclosure be translated into as many as 13 different languages. Finally, the statue required the disclosure to appear in any advertisement for a given center, with the disclosure’s text size even larger than the text of the advertisement itself. Just how burdensome the edict would become was perfectly depicted in this image from the amicus brief of Heartbeat International, a pregnancy help network of over 2,600 affilates. Danielle White, legal counsel for Heartbeat International, lauded Friday’s order as a positive conclusion to an unnecessary three-year legal saga. Since NIFLA was decided in June, a federal district court struck down a Hawaii law and the city of Baltimore’s spending board voted to pay $1.1 million to cover the legal fees of Greater Baltimore Center for Pregnancy Concerns — a pregnancy help center that serves 1,200 clients annually — after a federal court ruled in January that the city law violated the center’s First Amendment rights. Despite the mounting losses, other cities and states have persisted in advancing their own onerous measures. On October 1, Hartford, Connecticut began the enforcement of its law which targets the city’s lone pregnancy help center with a disclosure order similar to California’s. One state representative in Michigan is currently advancing his own version of the unconstitutional law, and the state of Illinois is continuing to push its law forcing medical providers to inform patients about abortion, even if it violates the provider’s the religious beliefs or moral values. I depend on life-support to stay alive. Why I oppose assisted suicide laws.